I am working on getting organized for next year. With a baby coming at the end of August, I know it's gonna be tough to get going afterwards! Millie is starting Kindergarten, so I'm trying to get ready. I have been thinking about ordering a box curriculum for her, but I realize when I look at the scope and sequence, she is already a few months into the curriculum. 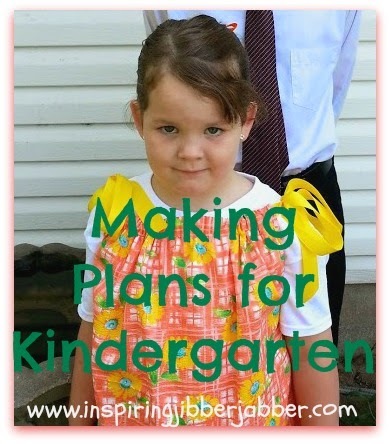 Anyway, I'm gathering links, supplies, ideas, and so on....to do kindergarten. I will adding more to it throughout the summer, so check back often! I have added a new Kindergarten tab at the top of my website! It has links to printables assessment pages, GLE's, goals, sight words, free curriculum resources, and much more! I am doing this really for myself, but I'm sure there's someone else out there in my boat too! I hope you will check it out, and please message me if you know of a good, cheap or free, resource I am missing.